What is this tightness at my throat? If I was a man in a gray flannel suit, I'd wait for a particularly intense boardroom meeting and then grasp the knot of the tie at my throat and yank down, wrenching it away from me. But I'm no man, there's no tie, no noose. And life, really, is grand. Rick Bragg, Pulitzer Prize winner, penned a memoir entitled All Over But The Shoutin'. Man, I loved that book. Read it to pieces. Cover to cover until the covers came off, tattered the way teenagers believe real love should leave you. The stories he weaves are imperfect but impeccable. They are songs of the South, throaty odes to football, fried chicken, even poverty. My favorite part though, is the crimson undercurrent. Bitterness, pride, valor, blood. And the red bird. 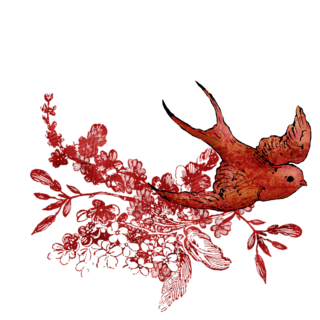 As a boy, Bragg watched a red bird fling itself at the rearview mirror of a car. Again and again, smashing its face and body into the glass until a spiderweb of cracks bloomed from the center of the mirror. I can hear the strained sound of splitting glass, feel the heat pulsing above the blacktop like waves of water. Bragg turned to an old man and asked why the bird acted that way. The old man replied, "I guess it's just its nature." Nature is a powerful force, heavy handed. Is there any arguing with Nature, her hands on her hips and stomping straight at you? I imagine the bird finally fell to the asphault, exhausted by the mission it felt was inevitable, bent on its own destruction because it knew no other way. I hope that, after it could no longer see its reflection, it spread its bloody wings and flew away. Sometimes I dream that bird. I dream it, scarlet feathers and all. I dream its passion and its fury. And I wake from those dreams ready to sprint as far and as fast as possible from any mirror in the world.